Ace Books, 1991. Mass Market Paperback. Good. Paperback. Sound, & nice copy, light to moderate shelf/reading wear, minor thumbing wear. 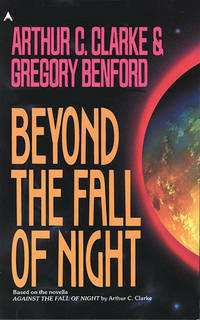 Beyond the Fall of Night (1990) is a novel by Gregory Benford and Arthur C. Clarke. The first part of Beyond the Fall of Night is a reprint of Clarke’s famous Against the Fall of Night while the second half is a "sequel" by Gregory Benford which takes place many years later. This book is unrelated to The City and the Stars which is an expanded version of Against the Fall of Night which Clarke wrote himself three years after the publication of Against the Fall of Night. Place: E Rutherford, New Jersey, U.s.a.